Turkey has detained another man for wearing a ‘hero’ T-shirt on Saturday. According to media, a 20-year-old Trabzon man, identified as A.G., was taken under custody while he was in a crowd watching the scene of a traffic accident in Arakli district where a car crashed into a convenience store. A.G. was handcuffed before being forced into a police van that was dispatched to the area originally for the accident. A.G. reportedly told police that he is not aware of any legal restriction for wearing such a T-shirt. 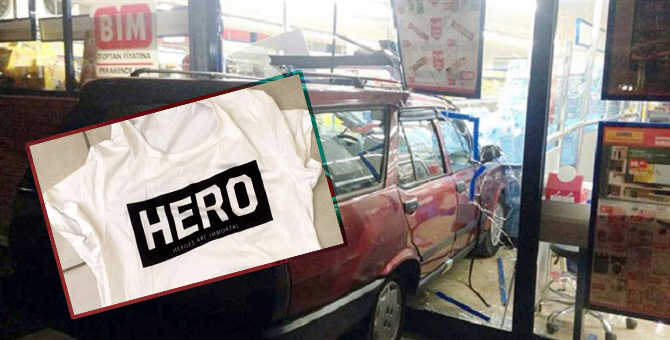 The T-shirts bearing the word “hero” have become a contentious issue when Gökhan Güçlü, one of the suspects on trial for an assassination attempt against President Recep Tayyip Erdoğan on the night of the July 15, 2016 failed coup, was thrown out of the courtroom for wearing a T-shirt bearing the word “hero” because it caused tension between the parties during the hearing. At least 37 people have been detained for wearing hero T-shirts since mid-last month.